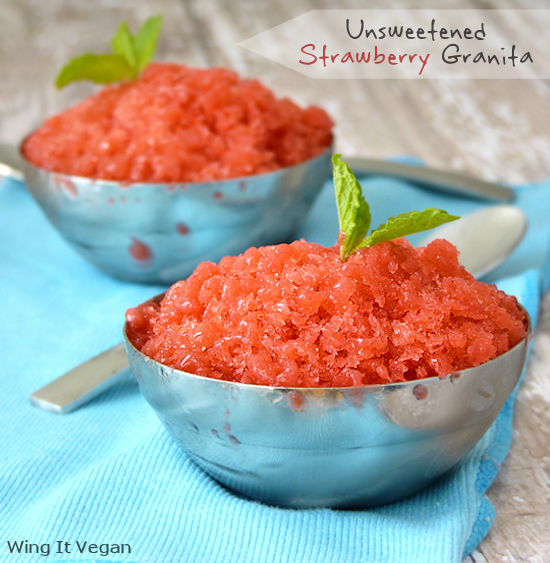 Wing It Vegan: Strawberry Granita - Hello MoFo! Strawberry Granita - Hello MoFo! Hello! Remember me? 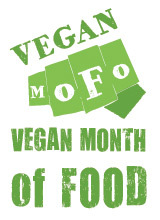 I'm back again after my long traveling/working hiatus - just in time for Vegan MoFo! As always, I waited until the last minute to register because I wasn't sure I'd be able to pull if off. Will I? Who knows! It's a lot of blogging and I'm quite rusty, but let's give it a try. No theme for me this year again, unless "Lazy MoFo" is a theme because that's what I'm going to be doing. Recipes from other blogs or cookbooks instead of my own will be featured daily (hopefully!) and all I have to do is cook'em, shoot'em, and blog'em. And eat'em. Here we go! Is there a homemade dessert that is easier than granita? I've never met one. All you have to do to make this Italian ice, is make a smoothie and then freeze it, poking and scraping it with a fork every thirty minutes to keep it from freezing in the shape of a brick. Done! That's the unsweetened version anyway, if you want to make a more traditional granita you need to either make a sugar syrup first, or just let your fruit macerate with sugar for a while. David Lebovitz, whose recipes never let me down, explains how to make it and shares a recipe here. If you want to go with a less traditional unsweetened granita like mine, omit the sugar and skip steps one and two. You can also use coconut water or some sort of fruit juice that wouldn't clash with the strawberries instead of plain water, and of course granita can be made with other fruits too. Peach and pineapple are particularly lovely flavors! By the way, Strawberry Granita tastes absolutely heavenly with a nice scoop of fresh mint-chip ice cream. Good ol' vanilla ice cream will do too! And now, as it is customary around here, I will leave you with a picture of something cute. 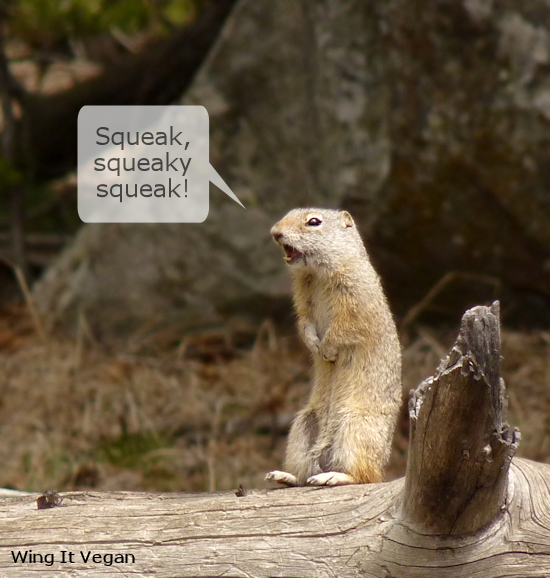 This Uinta Ground Squirrel was squeaking something or another at us in Yellowstone National Park a few months ago. We never knew what it was saying, but it sounded pretty hostile. Happy Vegan MoFo! Are you participating? Cindy! I can't even imagine how much you must be missing Maria. I hope time flies by for you until her next visit! Welcome back! You've been missed! I've only ever made one of David Lebovitz's recipes, but it was a total success for me too (pickled turnips). I'll have to check out the granita. It sounds terrific! Thanks, Cadry!! Mr. Lebovitz has all the good recipes! Yay!! I always love your blog during mofo. well i always love it but yay mofo!! Have fun with MoFo, Liane! Ha! I knew you'd show up for mofo. The granita recipe sounds great and easy, except for the hard part of remembering to scrape it every 30 minutes. Remembering is hard! Yes, I'm trying to mofo. Yes! I had to set my timer for 30 minutes each time after I scraped it with a fork, or else I would have checked it six hours later only to find a big strawberry brick in the freezer! Go MoFo! That looks so darn refreshing, River! River!! Welcome back to MoFo. Honestly I was on the fence about mofo this year too, my life has been more hectic and unsettled than usual lately. But, I'm glad I gave it a go - and actually (so far) it feels nice to be back in the saddle. The granita looks so glorious and alive and delicious! Also, I love the way that ground squirrel's little toes are lifting off the log. squee! Thank you!! MoFo can sure add to life's hecticness, but I'm also glad I gave it a go. The squirrel's little toes lifted off the ground with every squeak! The little thing was so little that his own squeaks propelled him back! Him? Her? How can one tell, I wonder? You're back!!! Love the new photo on your sidebar. I'm so excited to get a River post every day! Katie! I really hope I can stick with it the whole month! Wish me luck! Funny story about the new photo. 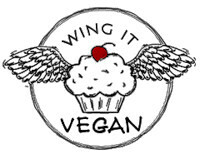 I didn't realize that maybe the cupcake should have had a cherry on top instead of a raspberry (to match the Wing It logo) until after the picture had been taken and uploaded to the blog. Now it's getting on my nerves that I didn't think ahead! Oy! I am so glad you are participating, River! Thanks, Mihl! Your theme is one of my favorites this year! RIVER! You're back, this makes me v.v.v.happy! Mandee!! It's so nice to get the old MoFo gang back together again! Definitely make some granita! 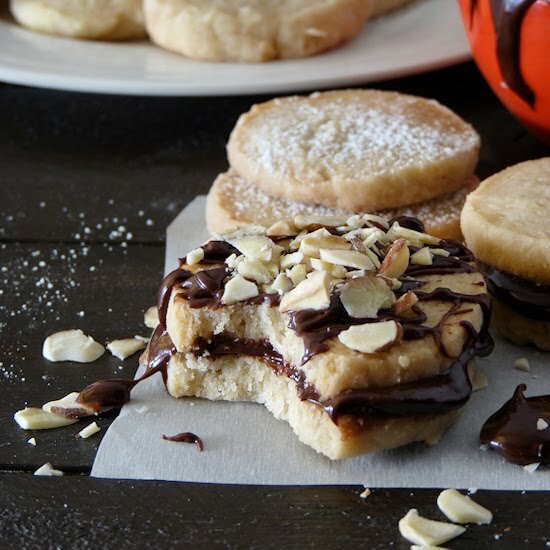 Don't you love it when a classic recipe is naturally vegan, soy-free and gluten-free? Score! Happy you're back! I was hoping you'd poke your head up during Mofo :) granita sounds super refreshing and squirrel!! Your fluffy Newfoundland bread still is and will always be my favorite EVER! Just sayin'.